"We are Indian, We Count"
Top Fact: Census data are used to distribute $400 billion in federal funds to local, state and tribal governments each year. Click to see official CALIE PHOTO BLOG pictures produced at the Pala Casino, Pala Indian Reservation. PALA INDIAN RESERVATION, August 25-26, 2009 — American Indian community members and activists came together at the Pala Casino and Resort Tuesday and Wednesday to discuss and organize participation in the upcoming 2010 U.S. Census. 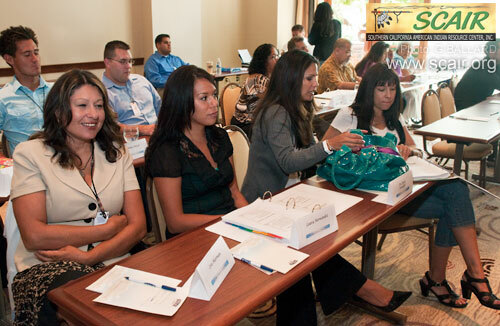 Tribes from San Diego County and the Los Angeles region attended the Tribal Government Liaison Training, which included information on the Census Bureau’s organization, operations and Census data reporting as well as a review of the 2010 Census questionnaire. 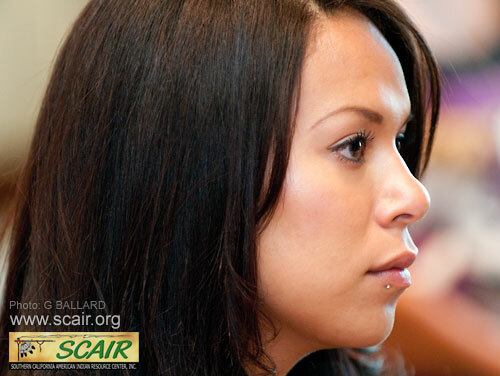 The Tribal Census Bureau American Indian and Alaskan Native (AIAN) staff was eager to send a paramount message to promote awareness about the importance of tribal participation, improving tribal cooperation and tailoring outreach differently to specific tribes. Their goal was to achieve a 100 percent AIAN count, to respect the government-to-government relationship and to mobilize hiring committees in tribal communities for enumerator positions (opening up Fall 2009). "The event was both a success and a wonderful representation of how American Indians can work together to empower the entire community," said Partnership Specialist Dr. Joely Proudfit, who helped organize and lead the event. 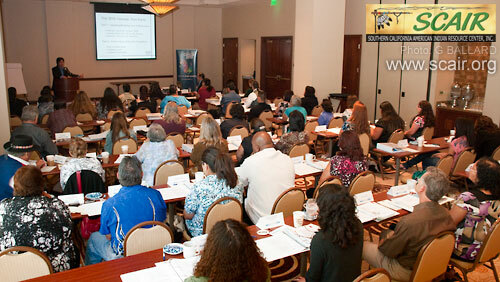 The training also provided intertribal networking and social opportunities. 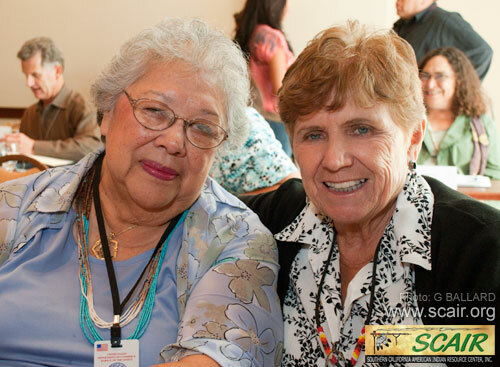 Attendees included tribal liaisons, community-based Tribal organizations, Tribal elders, social organizations, services, and partners that serve San Diego, Riverside and San Bernardino counties. Tribal specialists, assistants and consultants — most of whom are American Indian — were also on hand to find ways to cater to Tribal needs during the coming months of the outreach process, as well as to help raise awareness about the goal of getting everyone counted this year. Why is it important to be counted? Because each person who ignores the Census not only gives up his or her right to be considered in government decisions involving funding for essential services and resources (such as land, emergency services, senior citizens, health care and education), but also costs the community a piece of its future. EXAMPLE 1: CHECK ONLY ONE BOX! 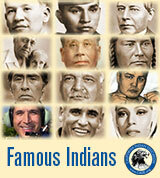 EXAMPLE 2: If you are a member of an Indian tribe. If you are a member of an Indian tribe, write in the official name of the tribe as it is recognized by the Bureau of Indian Affairs BIA. 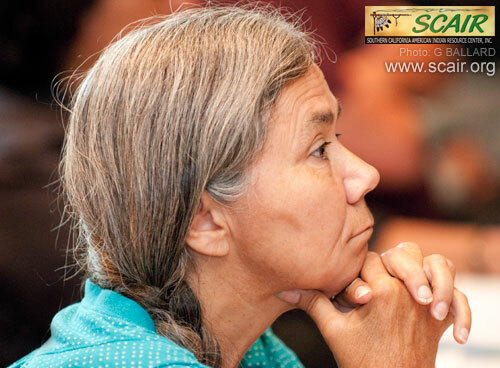 By properly filling in your tribal affiliation, your tribe will receive benefits of higher population statistics. EXAMPLE 3: Not a member of a particular tribe. 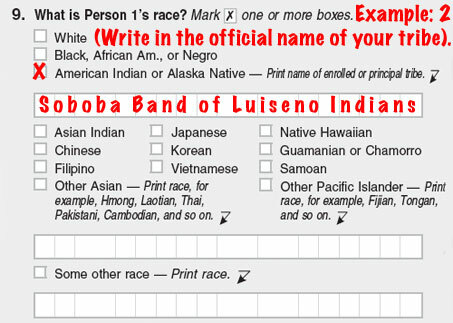 If you are a Luiseno Indian, but not enrolled with an Indian tribe — for example — write in your principal Indian nation: Luiseno. 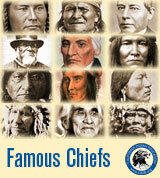 It is important that each family member be listed as an American Indian FIRST (under the appropriate principal tribe or nation) BECAUSE question #9 ensures American Indians will be accurately represented in their urban and reservation communities so their respective tribal groups can better qualify for federal funding and social services. By properly filling in your Indigenous nation, your people and community will receive the benefits of higher population statistics. 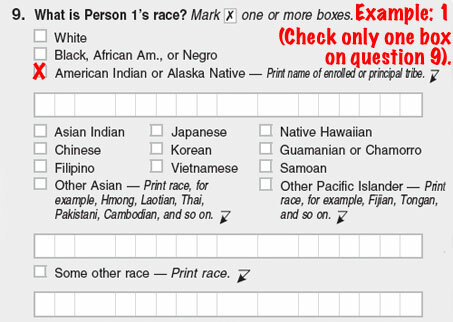 OFFICIAL US GOVERNMENT CENSUS 2010 WEB SITE includes forms, FAQs (frequently asked questions & answers). • The census is mandated by the U.S. Constitution. • The next census is in 2010. • Your participation in the census is required by law. • It takes less than 10 minutes to complete. • Federal law protects the personal information you share during the census. 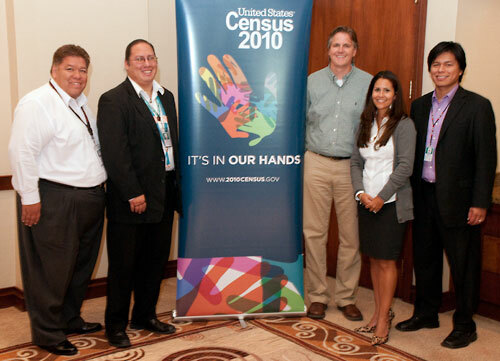 The U.S. Census Bureau is taking an innovative and successful approach to counting American Indian and Alaskan Native people and communities for 2010 — by reaching out to the native population via American Indian consultants, specialists, Indian Partnership Assistants and Tribal Liaisons. These trusted friends and consultants within Tribal communities were a key to the success of this week's two-day training event at Pala Indian Reservation. 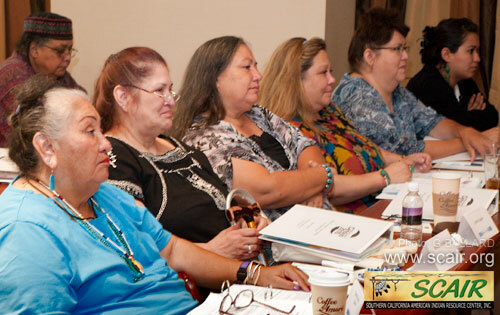 Momentum has been building nationwide among community advocates to mobilize and educate the Native community about the critical importance of being actively involved with the U.S. Census. 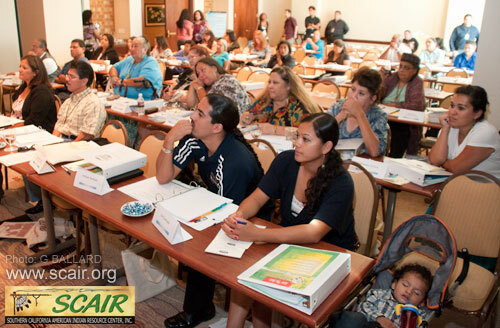 Organizers and individuals such as those in attendance this week are working hard to reach out into the Indian community to teach the skill necessary to make sure that every American Indian and Alaska Native in the region is counted and added to the population count. This is of utmost importance because full AIAN participation in the U.S. Census can assure that essential services and resources are provided to reservations as well as to Urban Indians, which ensures the community's success as a whole. Information given to the U.S. Census will rob you of privacy and be used against you. All Census data collected — including addresses — are confidential and protected by law from distribution to the FBI, CIA, Welfare, Immigration or any other government agency. No court of law, not even the U.S. president, can find out respondents' answers. Census employees take an oath to protect this information, and any violation of that oath is punishable by severe fine and up to five years in prison. 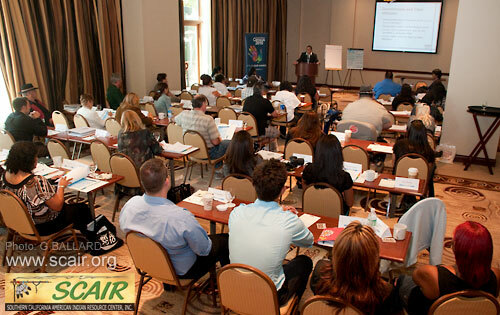 The 2010 approach of the U.S. Census shows the government's eagerness to receive input from the AIAN community. By banding together to ensure each individual is counted, the AIAN community can not only welcome this gesture but also take advantage of the benefits and ensure the community's success as a whole. Questions Planned for the 2010 Census and American Community Survey PDF including government Census forms for Age; Gender; Race; Relationship; Marital Status; Fertility; Grandparents as Caregivers; Ancestry; Place of Birth, Citizenship, and Year of Entry; Language Spoken at Home; Educational Attainment and School Enrollment; Veteran Status and Period of Military Service; Disability (and many other areas...). 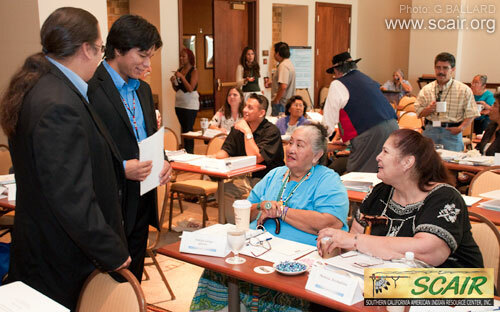 Partnership Specialist-Team Leader Timothy Harjo (Fort Sill Chiricahua Apache) welcomed the group of urban and reservation American Indians, Alaska Natives, and 20101 Census workers. 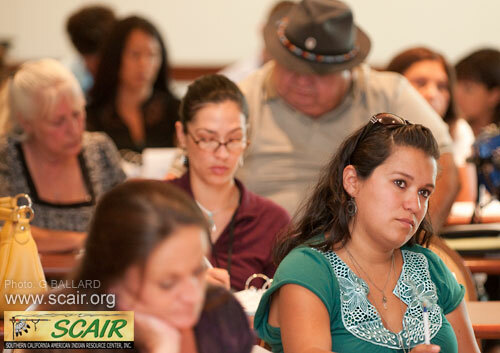 Joely Proudfit, Ph.D. (Luiseño) — Consultant, Tribal and Urban Indian Communities Team — took a very active role in the event and is pictured here listening to a participant's question. 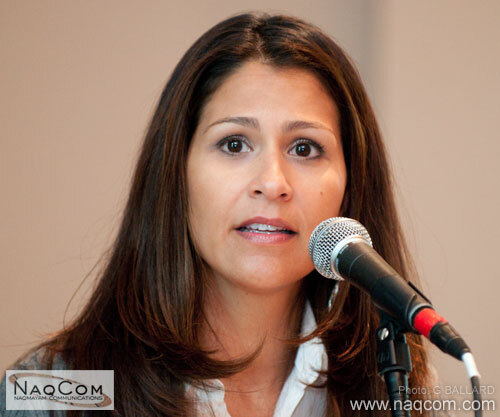 Dr. Proudfit owns Naqmayam Communications — Naqmayam Communications is an independent, full service California Indian owned and operated public relations agency. Naqmayam Communications specializes in building trust between brands and communities through grass roots outreach and media relations. Joely Proudfit, Ph.D. (Luiseño), serves on the California Indian Museum and Cultural Center CIMCC Board of Directors as Secretary/Treasurer. 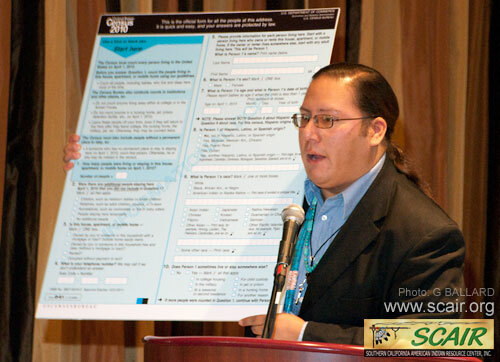 Partnership Specialist Eric Sanchez (Navajo) went over some of the 2010 Census forms. Partnership Specialist Kyle Crandell (Pomo). The turnout of American Indians living in Southern California was good both days. 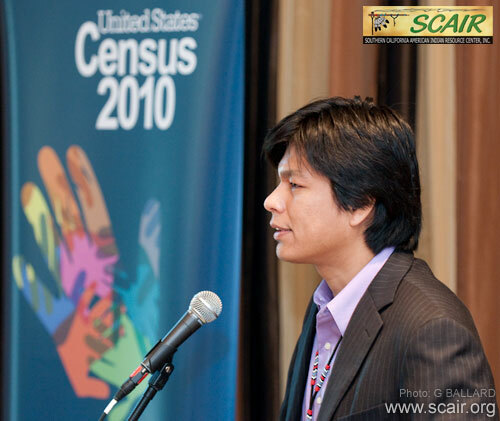 Ernie C. Salgado Jr. (Luiseño), editor of The Indian Reporter, asks the Census officials why California is split in two regions on the U.S. Census map (below). 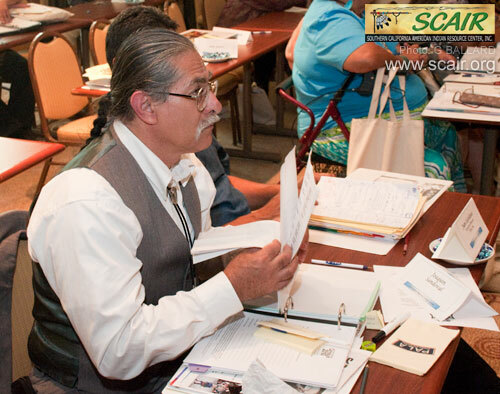 Mr. Salgado is an enrolled member of the Soboba Band of Luiseño Indians and the brother of Soboba Chairman Robert Salgado. 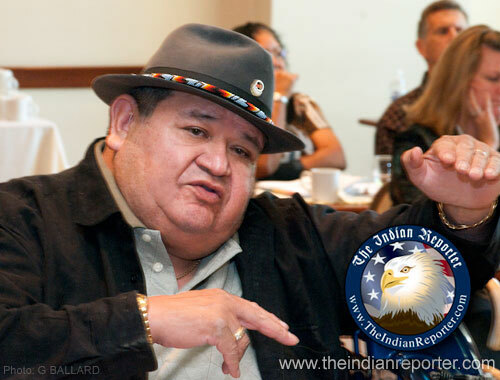 Alongside his father — Ernie C. Salgado Sr. — Ernie Junior and his brother, Bobby, have a maintained a deep family history in California tribal politics. Webmaster note: Mr. Salgado is not levitating the eagle design in this photo, it is the new logo he designed for "The Indian Reporter" newsletter and Web site, and it seemed like a creative way to lay out the graphic. 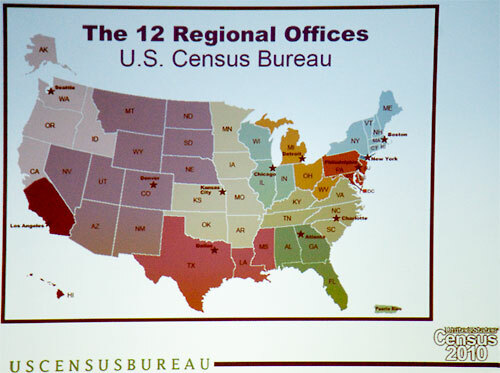 US Census Bureau map of The 12 Regional Offices (note California is split into two regions). 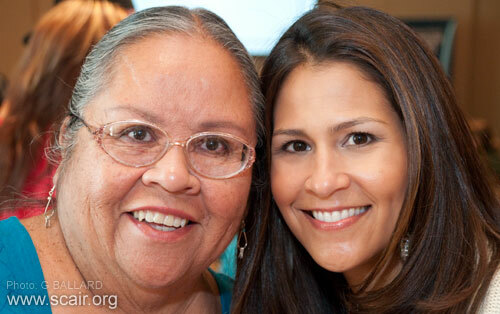 Violet Alexandria, executive director, Tonkawa Seniors of San Diego, paid close attention to the presentation and is pictured below seated beside her mother, Alexandria Tunohun. 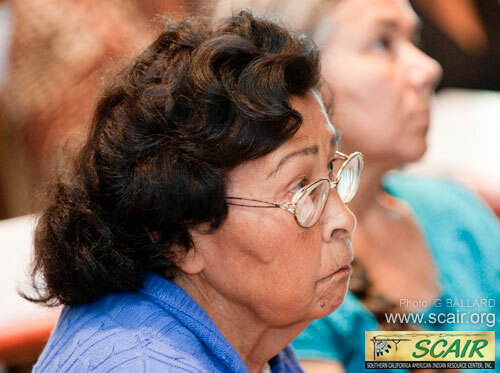 The Indigenous Alaska Native women have lived in San Diego County since leaving the Kodiak area some 50 years ago, and are important members of Southern California's urban Indian population. 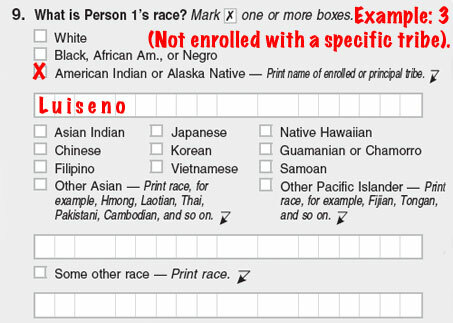 It is important for urban Natives to list themselves and family members as "American Indian" or "Alaska Native" under Question 9. of the Census form to ensure American Indians are accurately represented in their communities so their respective tribal nations can better qualify for federal funding and social services. 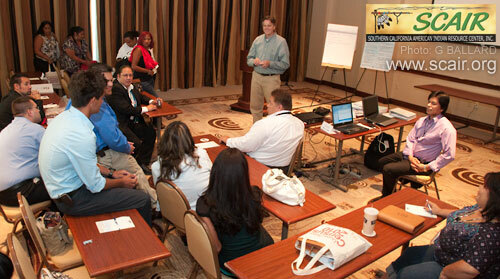 There was plenty of time for socializing and networking during the two-day event. Partnership Assistant Laura Hernandez (San Pasqual-Pauma) was one of the young Southern California Native women who attended the event. 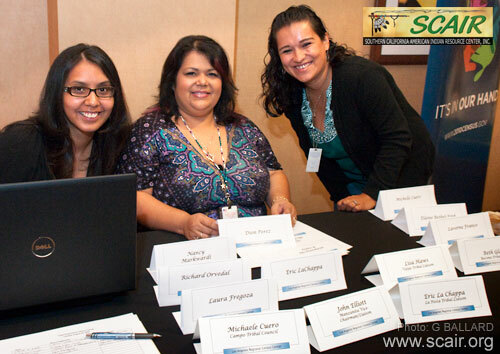 SOUTHERN CALIFORNIA GIRLS: (L-r) Lisa Sherman (Iipay Nation of Santa Ysabel) Partnership Assistant; Laura Hernandez (San Pasqual-Pauma), Partnership Assistant; Joely Proudfit (Luiseño) Tribal Consultant Census 2010; Edith Atwood (Luiseño). Smiling happy faces greeted the participants at the check-in table. Their were lots of free goodies for participants, including this large Native American Indian map. 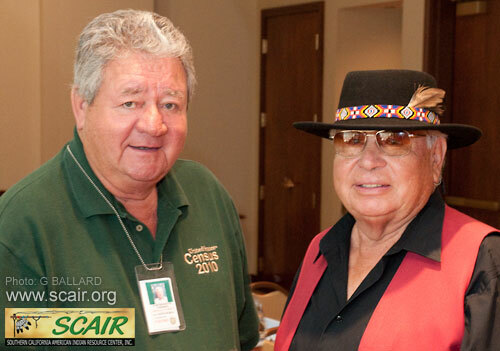 Ronald Glidden took a photo with Randy Edmonds (Kiowa-Caddo). Randy gave the traditional-style invocation at the start of the event. 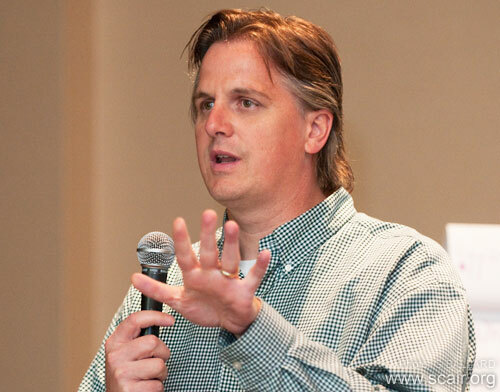 Randy is the SCAIR Senior Advisor. The Southern California Tribal Chairmen's Association SCTCA San Diego TANF Site Manager Lynne Ray Smith took a photo with TANF Site Director Melanie Luna (Iipay Nation of Santa Ysabel), and Pala TANF Site Manager Yvette Yazzie (Navajo). Josh Gonzales sits in the front row with his wife and young baby. Judy D. Oyos (Mesa Grande Band of Mission Indians), editor of On Trial Magazine, American Indian Edition, asked questions of the Census presenters. 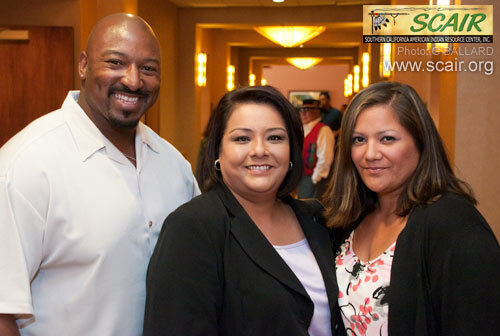 Seated (l-r) to the right are Mesa Grande Council Member Virgil F. Oyos; Carmelita Moore; and Vice Chairwoman Michelle Cuero of the Campo Kumeyaay Nation. 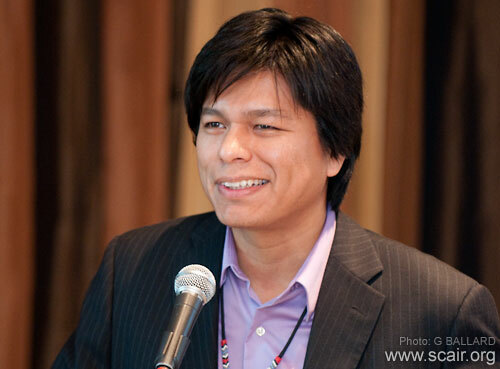 Ernie Salgado Jr. (Luiseño) — founder of the www.CALIE.org Web site, took an active role in the discussions — Ernie's Web portal of Native American Web sites is averaging well over 2,000,000 hits a month serving urban and reservation Indigenous tribal communities around the world. 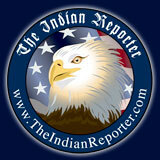 Please see Mr. Salgado's tribal blogs for his published articles and Indian humor. 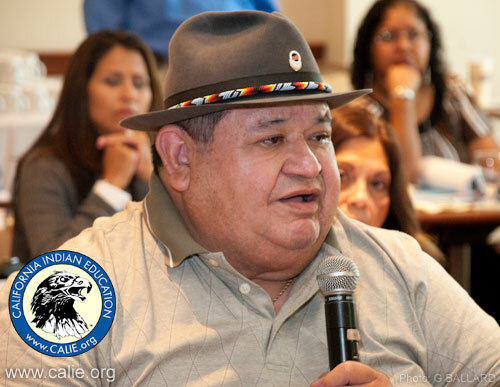 As the founder of Ahmium Education, Inc., in 1975, Ernie Salgado has been directly involved in California Indian Education for more than 35 years. Also deeply involved in tribal government relations, Ernie Salgado has served some 10 years as chairman of the Soboba Band of Luiseño Indians. 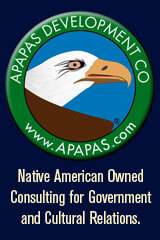 Mr. Salgado is the founder and Chief Executive Officer CEO of Apapas Development Co., a privately-owned Native American Indian company that specializes in professional consulting services, including communications for government and cultural relations and effective marketing strategies in the Digital Age. 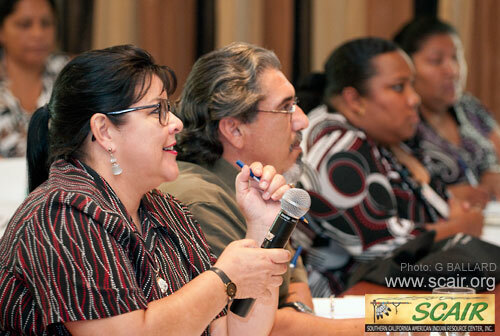 AIAN Partnership Assistant Virginia Arvizu (Gabrielino-Tongva) pictured in green blouse during the presentation. 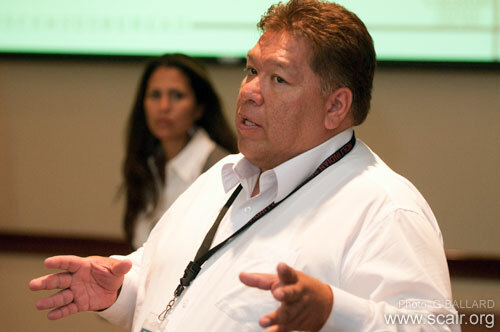 Partnership Specialist-Team Leader Timothy Harjo (Fort Sill Chiricahua Apache). 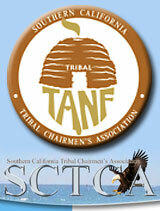 Southern California Tribal Chairmen's Association SCTCA Case Worker Eddie Perez talked with presenters. Pala TANF Site Manager Yvette Yazzie (Navajo), is seated to the left. Establishing shot of the event at the Pala Hotel and Resort. Joaquin Sandoval (Mescalero Apache) has 20 years of service in the US Navy. He is a retired veteran of the Vietnam era. He, like so many of our Native American Warriors, comes from a long line of Warriors volunteering to defend this land. His Father, Brother and son all served in the Military: Air Force, Army and Navy. His Father served in the Army during WWII. Joaquin continues to be highly involved in community and activist organizations, always ready to participate in Gourd dance and Honor Guard activities with fellow American Indian Warriors Association veterans. 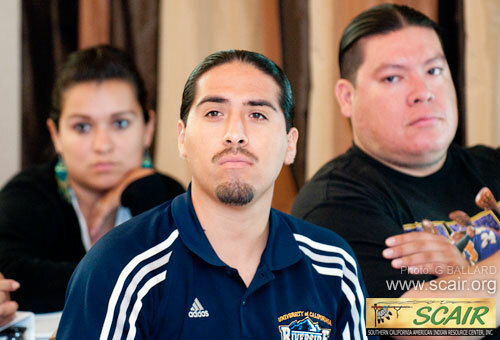 (L-r) Virginia Arvizu, AIAN Partnership Assistant (Gabrielino-Tongva); Josh Gonzales; William Madrigal (Cahuilla-Lusieno) — both men are American Indian students from the UCR University of California Riverside. Randy Edmonds (Kiowa-Caddo); Devon Lee Lomayesva Esq. 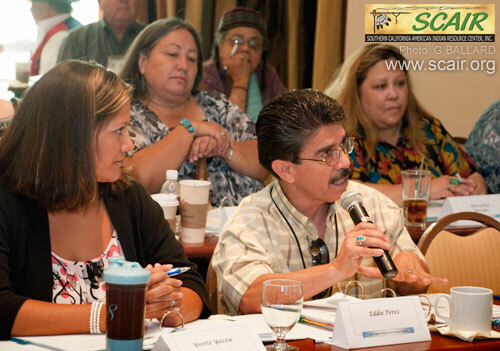 (Iipay Nation of Santa Ysabel), Executive Director California Indian Legal Services CILS; Dwight K. Lomayesva III (Hopi), Executive Director of the American Indian Recruitment AIR programs. 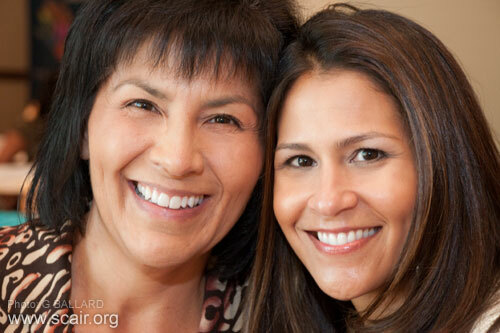 Ruth Wahpecome (Creek) serves on the board of directors of the Indian Human Resource Center IHRC and is pictured with Bonnie Edmonds (Ojibwa). Councilwoman Beth Glasco, Barona Band of Mission Indians, takes a photo with Dr. Proudfit (Luiseño). 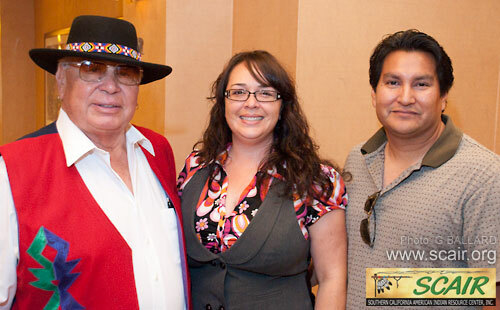 Frances Muncy, Morongo Band of Mission Indians, takes a photo with Joely Proudfit (Luiseño). Frances is a long-time employee of the Bureau of Indian Affairs and the women are dear family friends. 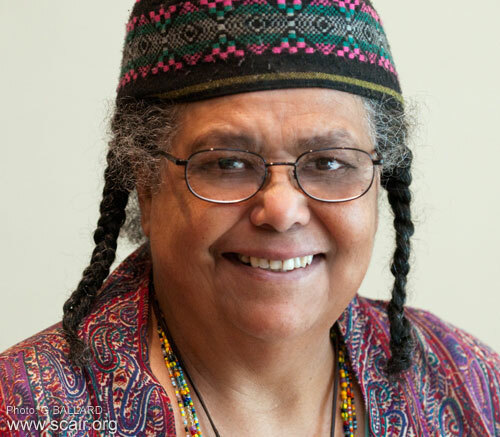 Rose Davis (Black-Seminole), founder and editor of Indian Voices community newspaper, circulation 15,000 (printed), attended the event and posed for a new business portrait. Young red hair female model Renicia Smith-Wordlaw (Torres Martinez Desert Cahuilla) strikes a fun modeling pose holding a red Census logo T-shirt as her associates in the background share in the laugh. Participants were each given a Census 2010 logo T-shirt and a leather calendar planner for completing the training. (L-r) Kyle Crandell, (Pomo) Tribal & Urban Indian Partnership Specialist; Eric Sanchez, (Navajo) Tribal & Urban Indian Partnership Specialist; James T. Christy, Census Regional Director, Los Angeles Region; Joely Proudfit, Ph.D. (Luiseno) Consultant, Tribal & Urban Indian Communities; Tim Harjo (Apache) Tribal & Urban Indian Partnership Specialist. 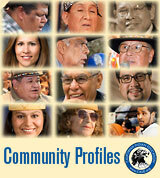 Tribal liaisons 2010 Census, Southern California region. 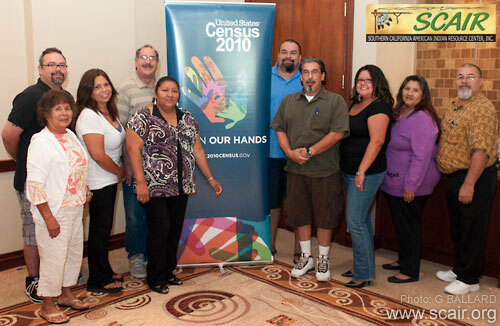 Los Angeles Region AIAN Census Team and Tribal Liaisons. PROFESSIONAL WEB BLOG SERVICES AND PHOTOGRAPHY BY CALIE WEBMASTER GARY G. BALLARD.